Amersham Road, Caversham, RG4 5BP. The Weller Centre is based on the Amersham Road estate in Lower Caversham. There is a small area of land to one side, which had become overgrown and rarely used. 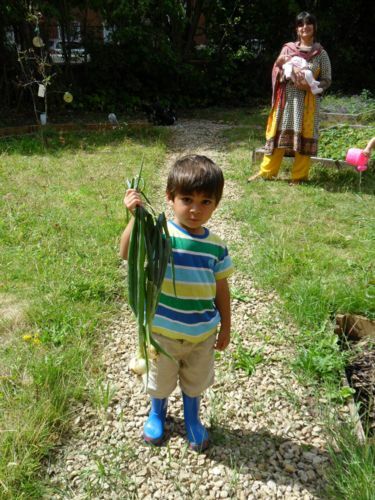 Since March 2011, food4families has been working with various community groups and with families and young children, who use the neighbouring Caversham Children’s Centre, to create a food-growing garden. Much of the initial hard work was done by the youth group at the Community Centre. We have also had help and support from corporate volunteer groups. There are now several raised beds, some fruit trees and a pergola, with plans for a brick barbeque. With the help of volunteers, we have now installed a 15,000 litre waterbutt. The fruit trees,raspberry canes and other soft fruit are doing well. 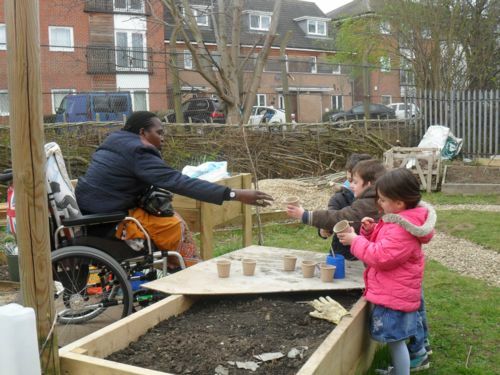 The strawberries and raspberries were enjoyed by many of the groups using the garden. We have added more raised beds to the garden and plan to add even more. A new path around the old beds is ready to be edged and covered with woodchip and there are lots of maturing lavender plants, ready to go around the edges of the new paths. If we are lucky we find frogs and toads in the long grass; these are fed on a rich diet of slugs and snails! Children are filling compostible pots with earth for young seedlings. Notice the height of the bed to aid those with limited mobility. 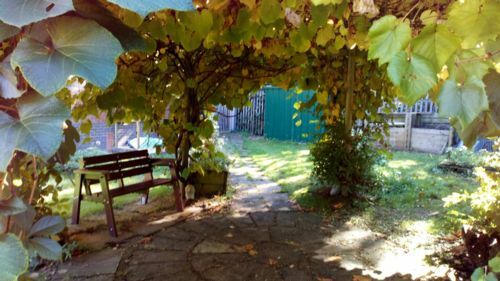 A shaded well-developed pergola area within The Weller Centre Community Garden. It must be Harvest tme! 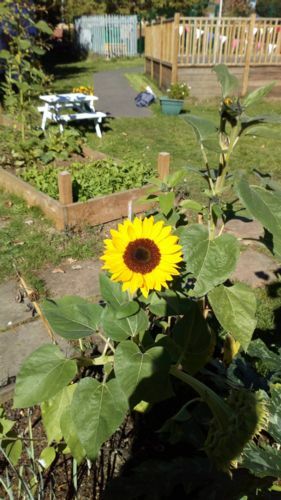 We would be very welcoming to any more members of the community, who come along and see what we do.If you would like to find out more about the project please contact us.